August | 2010 | Read it! Read it! On August 9, we posted information about an April 2010 banning of the 2008 Campus Read book, The Absolutely True Diary of a Part-time Indian by Sherman Alexie, in Stockton, Missouri. The book won numerous awards, including the 2007 National Book Award for Young People’s Literature. The Stockton R-1 School Board has now scheduled a special meeting on September 8, 2010, to discuss removing the book from the curriculum and the library. For more details, visit the Cedar County Republican. 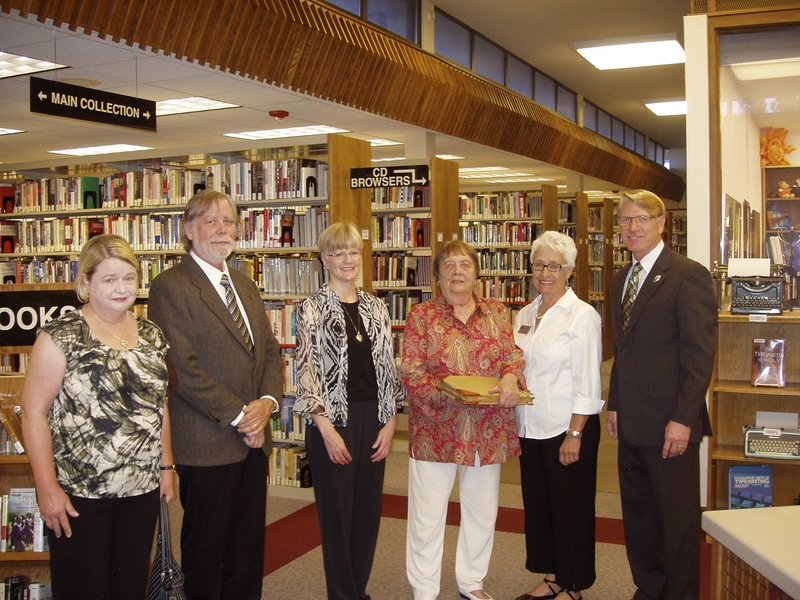 Norma (Swensen) Groethe, daughter of Dr. Walter J. Swensen, the first dean and one of the founders of Bismarck State College (then Bismarck Junior College), presented a book of her father’s personal papers related to Bismarck State to the BSC Library Archives on August 24, 2010. Norma’s son, Mark, and his wife, Anita, were also in attendance. This gift helps tell the story of the early years of Bismarck State College and we are delighted to have it! 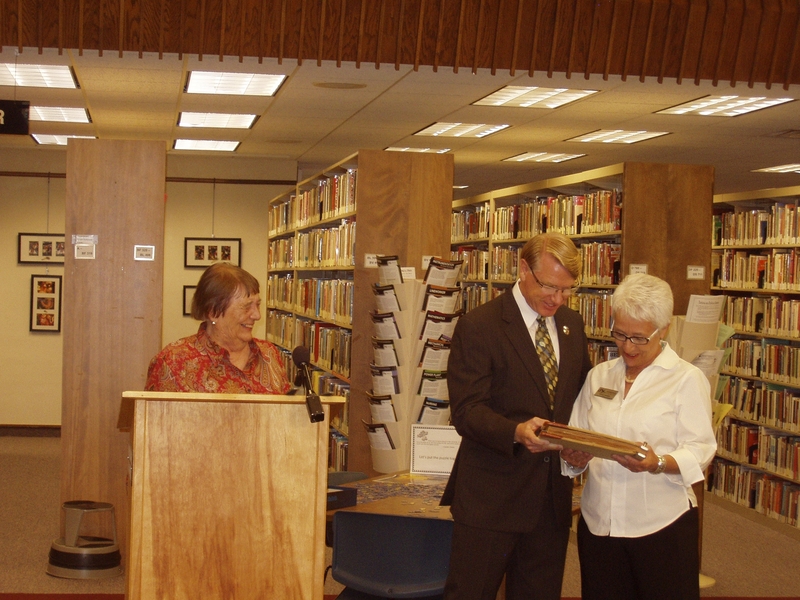 The book will be housed in the Library’s Archives collection. Do you have a piece of BJC/BSC history? We welcome your gifts. North Dakota is bucking another trend … at least for now. Other states are not so fortunate. Public libraries around the country are closing or laying off staff, reducing hours, or otherwise suffering from the economic downturn. Why does it matter? Can you do anything about it? Check out LosingLibraries.org to find out more. We look forward to the start of a new semester and working with you! Do take advantage of all the library has to offer. Monday, August 16 – Thursday, August 19 — 7:30 a.m. to 5 p.m.
Friday, August 20 — 7:30 a.m. to 4 p.m.
Sunday, August 22 — Noon to 4 p.m.
Monday – Thursday — 7:30 a.m. to 9 p.m.
Friday — 7:30 a.m. to 4 p.m.
***Note: Sunday hours, including open lab hours, will begin on Sunday, September 12. Interim/holiday hours and other changes are posted or are available by calling 701-224-5450 or 1-800-445-5073. Change & Innovation — Inevitable! Check out this clip on ‘Bronze Orientation Day.’ Guaranteed to make you laugh!